This Natural, 5 oz. 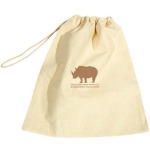 100% cotton pouch with a drawstring closure, an affordable and versatile carry all for a variety of uses, including a great goodie bag. Size: 10 1/2" x 12 1/2". I'm interested in learning about the Large Cotton Pouch. Please contact me.